Roy Hibbert, C, Georgetown: Should the NBA just assign Hibbert to the Jazz? It seems inevitable. Everyone knows that the Jazz want Hibbert and Hibbert wants to play on the Jazz. Few other teams with picks ahead of the Jazz want him (except for possibly Cleveland and New Jersey). Want more evidence that the Jazz are taking him? Larry H. said last week that if the Jazz had Mark Eaton last year, they would have taken the championship. Hibbert is the closest thing in the draft to Big Mark. So what's not to like? Nothing, as long as you're happy drafting a 7''2' Jarron Collins. Alexis Ajinca, C, France. Check out the guns on this guy! The young Frenchman has length to spare, or as they say in France, "lenf." His ceiling is Kevin Garnett in Calvin Booth's body. Ajinca is an intriguing pick, and is projected all over the board from late lottery to late first round. I wouldn't mind taking a risk that Le Petite Alex bulks up a little and becomes a rich man's Booth, but I don't see Jerry Sloan passing on Hibbert, a four-year letterman at a U.S. college, for a skinny French project. 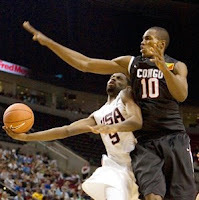 Serge Ibaka, PF, Congo. If you do nothing more today, please, please, for the love of all that is holy, check out Ibaka's highlight tape. It looks like it was filmed during Ibaka's stint in the West Jordan recreational basketball league. You can see Serge take on some of the shortest, whitest, slowest players ever to appear on an NBA draft highlight reel. It is obvious to my eyes that Serge could have started for the Murray Spartans. Also, it features extensive footage of the block drill. Longar Longar, PF/C, Oklahoma. (on left in photo). 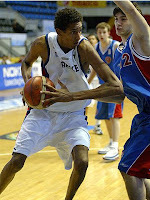 The Sudanese big man is a great athlete and a hard worker. He is a monster on the boards, but still needs to bulk up for the NBA. Unlike a lot of African bigs (Desagna?) he has pretty decent hands as well. Scouts worry, however, that he may have maxed out his potential - he's already 25. Likely a second rounder, if drafted at all. Upside: his name has endless that's-what-she-said potential. 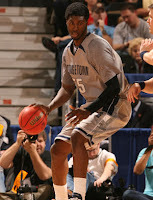 Sean Singletary, PG, Virginia. 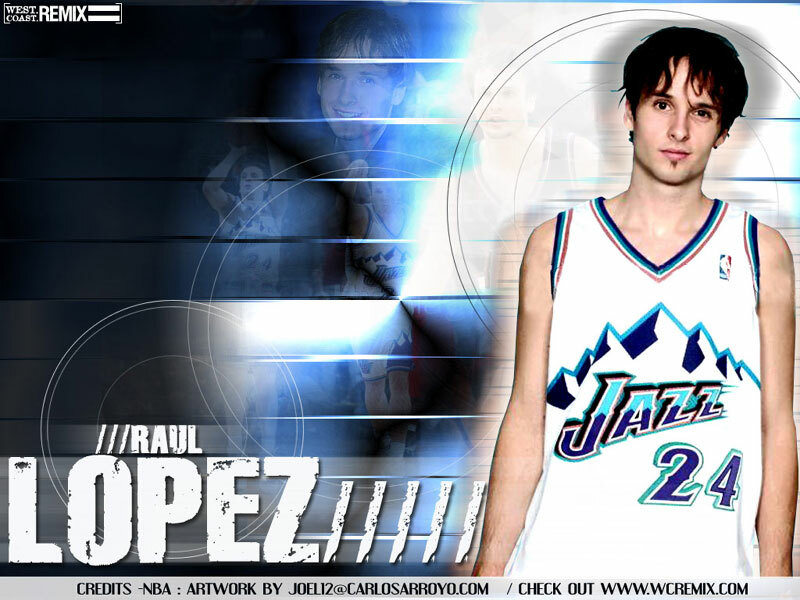 Undersized point guard who is known for his "razzle-dazzle." Does that sound like a Sloan guy? I didn't think so. ESPN's Hollinger predicts he will be a huge bust - even for a second rounder. Chad Ford, however, claims that he is a "Kevin O'Conner favorite." I don't see it. 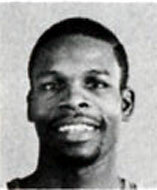 If the Jazz wanted a 5''11' point guard why did they let Dee Brown leave? Oh yeah, because he partied. Kyle Weaver, SG, Washington St. A shooting guard with great length who can also play a little PG, if needed. I'm intrigued by Weaver because he has great athleticism and his numbers were muted somewhat in college because he played in a defensive-oriented program with a motion offense. He could really blossom in the NBA. However, how many weak shooting two-guards can an NBA contender have on a roster? 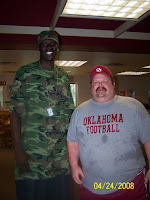 Question: Do we have any intel on Longar Longar's friend standing next to him in the Oklahoma football shirt? If that guy is draft eligible, I would not mind grabbing him in the second round. If nothing else I feel like he could probably be counted on to help Longar bulk up. Perhaps Longar Longar could lead to an updated version of Pasty's "Deeper, Deeper" joke.